I was raised by my parents as a Missouri Synod Lutheran. My childhood and teen years were filled with memorizing a lot of passages of Scripture from the King James Bible (it was pretty much the only translation used by Protestants at the time). 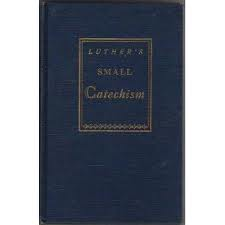 We memorized creeds and prayers, sang hymns in four parts from the hymnal, and our faith was formed by memorizing Luther’s Small Catechism (the Lutheran counterpart of the Baltimore Catechism for Catholics). As a Lutheran seminary student I dug deeper into the fundamental parts of Christian faith, what every Christian should know, or at least every Lutheran Christian. The one thing that was clear to Lutherans and most Protestants was that Mary was important as an historical figure but that’s about it. In fact I still remember the memorized passage from the small catechism: “I believe that Jesus Christ, true God, begotten of the Father from eternity, and also true man, born of the Virgin Mary, is my Lord.” That’s it. The only mention of Mary in the catechism is 5 words long; less than Mary was mentioned in the Bible. So it is no wonder that my consideration of Mary was put on a back burner. Later in life, as I worked as a musical director in a string of Catholic parishes in the Chicago area, I became seduced by the spirituality of the Catholic faith. Here I am, picking music and directing liturgies, gradually making the decision to convert and enter the RCIA program. It wasn’t an “aha!” moment, just a realization that my prayer life was Catholic, not Protestant, and I wanted to receive the Eucharist and be part of the Body that I served. The last bastion of my upbringing to fall was this “Mary” thing. I didn’t quite get it. In working for a Catholic publisher I came in regular contact with Br. Mickey McGrath, an amazing artist and author, and a person who became a good friend. One of the projects that I worked on with him was an art/music/meditation based on the titles of Mary found in the Litany of Loreto. This litany, one of the oldest prayers of the Catholic Church, is a list of the various titles we ascribe to Mary: Queen of Heaven, Our Lady of Peace, Mystical Rose, Gate of Heaven, Mother of Sorrows, and Our Lady of Refuge among them. In working on this project with Br. Mickey, I came in touch with Mary in a profound way. All of sudden the contemporary images helped me find a personal connection to Mary. Now that was truly an “aha!” moment. And this collaborative project became a beautiful book that I want to share with you. 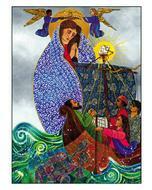 “Blessed Art Thou: Mother, Lady, Mystic, Queen” features vibrant contemporary art of the Virgin Mary. Brother Mickey also contributes his own writings and reflection that inspired the creation of each of the individual works in the book. Prayers are included with each image. 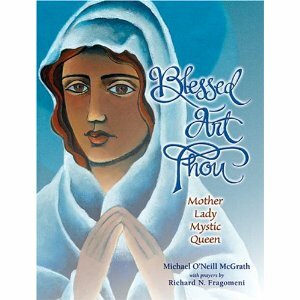 The book is not only a beautiful addition to a library and art collection but one that can aid in your prayer. 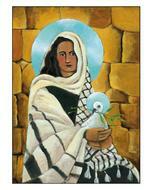 Mary is presented throughout as an inclusive and unifying figure in an increasingly diverse church. Br. Mickey takes a traditional symbol and image, and gives it a twist, sometimes humorous, sometimes profound. Some of the images may startle but ultimately speak with reverence and relevance to Catholics. Here is a link to a Youtube video based on the book.